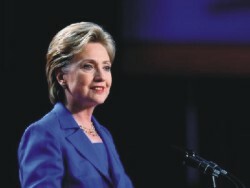 US Secretary of State Hillary Clinton should make strong appeals for human rights when she visits three Southeast Asian countries in the coming week, Human Rights Watch said on October 26, 2010. Human Rights Watch urged Clinton to call for the immediate release of imprisoned Vietnamese bloggers and human rights activists, seek an immediate halt to deepening harassment of the political opposition in Cambodia, and press for revocation of the Internal Security Act in Malaysia. Clinton will travel to Vietnam on October 29-30, 2010, Cambodia on October 31-November 1, and finally to Malaysia from November 1-3, meeting with the prime ministers and other top-level officials in each country. "This is Secretary of State Clinton's chance to tell top officials face-to-face that the US will not turn a blind eye when they try to cement their power by beating peaceful protesters or jailing opposition politicians," said Phil Robertson, deputy Asia director at Human Rights Watch. In July, Clinton said, "The United States will continue to urge Vietnam to strengthen its commitment to human rights and give its people an even greater say over the direction of their own lives." Unfortunately, many peaceful bloggers, community activists, anti-corruption watchdogs, and democracy advocates in Vietnam are bearing the brunt of an intensifying campaign of harassment, arrest, beatings in custody, unfair trials, and long prison terms as the Vietnamese Communist Party prepares for its five-year Congress in January 2011. "Hillary Clinton should follow up on her tough comments in July by reminding the Vietnamese Prime Minister that an internal party meeting is no excuse to ratchet up attacks against people peacefully demanding accountability and respect for human rights," Robertson said. "Free expression, including for bloggers, is critical for the Vietnamese economy and society to advance and grow." In particular, Clinton should call for the immediate release of Nguyen Van Hai (known as Dieu Cay) and Phan Thanh Hai (AnhbaSG), both bloggers jailed for their writings, Human Rights Watch said. In Cambodia, Clinton will meet Prime Minister Hun Sen and other top officials responsible for a systematic attack on the rights to freedom of assembly, association, and expression. The government crackdown appears designed to eradicate any organized political or civil society opposition to increasingly dictatorial rule by Hun Sen and his Cambodian People's Party (CPP). The recent sentencing in absentia of Sam Rainsy, the leader of the parliamentary opposition, to 10 years in prison on trumped up charges related to disseminating a map of the Cambodia-Vietnam border is just the latest travesty of justice under the ruling party's complete control of the judiciary, Human Rights Watch said. Clinton should clearly state the US government's serious concerns about the inadequacy and lack of fairness of the judicial proceedings against Rainsy and in other political cases. "Controlled judiciary, muzzled media, jailed political opponents, brutal military and police - Cambodia has it all," Robertson said. "The US can either stand with embattled activists pressing for human rights and accountability or close its eyes as authoritarian rule in Cambodia is institutionalized for years to come." It is critically important for the US to ensure proper and thorough vetting of both individual soldiers and military units seeking to take part in US-financed training and assistance programs with the Royal Cambodian Armed Forces, Human Rights Watch said. The credibility of the US military and government is on line with the Cambodian people, who have long suffered from human rights violations by army troops acting on their own, or at the behest of influential local businessmen, ruling party cadres, and local politicians. Finally, Clinton will travel to Kuala Lumpur to reinforce Washington's support for Malaysia. Human Rights Watch urged Clinton to make use of this relationship to press for much needed human rights reforms in Malaysia. Malaysia has a shameful record of violating basic rights using three varied yet highly draconian preventive detention laws - the Internal Security Act (ISA), the Emergency (Public Order and Prevention of Crime) Ordinance, and the Dangerous Drugs (Special Preventive Measures) Act. Upon taking office in April 2009, Prime Minister Najib Razak stated an "intention to uphold civil liberties" and expressed his "regard for the fundamental rights of the people of Malaysia." Yet despite government pledges to review and reform the preventive detention laws in parliament, the promised actions have yet to materialize. "Secretary of State Clinton should press the Malaysian government to end its addiction to preventive detention," Robertson said. "These laws are invariably misused and abused against criminal suspects and political opponents. So long as they are on the books, these laws spell trouble for basic rights."